The events that surround the Protestant Reformation were the culmination of a widespread, deep-seated need and desire to cleanse the Roman church of Religious superstition and false witness, rebelling against the beliefs and practices of the Church of Rome (the sale of indulgencies and absolution from sin etc.) and its dogmatic liturgies. The early Reformers had a desire to replace that form of worship with an Evangelical form of worship that would be based on biblical truth alone and not on iconoclasm, ritualism and the worship of relics or any other form of worship dreamed up by man. Without the Reformation there would today be no Orange Institution or the freedom of worship that we enjoy today. Many people in England believe that the Reformation came about as a result of King Henry VIII breaking away from Rome and establishing the Church of England. It could also be argued that the measure of Reformation permitted in England was also down to the decision of the Monarch. The Monarch at the time was Henry VIII; Henry in practice was a Roman Catholic until the day he died though he was responsible for the destruction of papal authority. The Reformed faith was established during the short reign of his son King Edward VI (1537-53) born to Queen Jane Seymour. Edward was responsible for the introduction of the 1522 Book of Common Prayer, the accompanying Acts of Uniformity, and the 42 Articles (1533), thus giving the Reformed faith direction. After the reign of Bloody Mary, Protestantism finally became the established Church of England under Elizabeth I with the passing of a new Act of Supremacy in 1559. The reappraisal of the established religious order of the day began long before that, as far back as 1376 John Wycliffe, known as the morning star of the reformation set before his students at Oxford 18 strongly stated theses opposing the methods of governance employed by the Roman Catholic faith at that time. In May 1415 at the Council of Constance Wycliffe was branded a heretic, 31 years after he had died. He wasn’t a heretic, just ahead of his time. October the 31st 1517 is the date commonly accepted as the birth of the Reformation. On this date Martin Luther nailed his 95 theses on the door of the castle church at Wittenberg. Luther’s attack on the sale of indulgences and, subsequently on papal authority and the sacraments (excepting baptism and the Eucharist) was condemned by the pope and the Holy Roman Emperor but gained the support of several German princes. 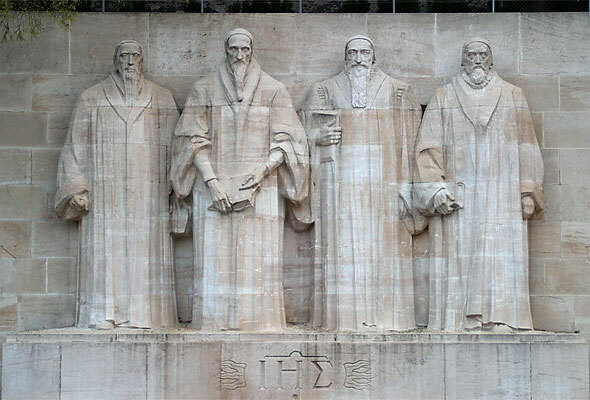 In Switzerland the mantle of the Reformation was taken up by Ulrich Zwingli in Zurich in 1520, spreading to Basle, Berne and also to Geneva where it was led by John Calvin who later on would form a friendship with John Knox. The shattering of the unity of Latin Christendom altered the course of European history. The rise of assertive Protestant churches and the reaction of the Roman Catholic Church stimulated a battle for the consciences of ordinary people throughout Europe that disrupted traditional loyalties and political arrangements. It took 150 years before an uneasy religious balance was restored. In 1500 the Church of Rome seemed to be stronger than ever. Paganism had been vanquished, the Iberian Reconquista had destroyed the last Islamic state in Western Europe; and the overthrow of the Byzantine Empire in 1453 had weakened the Orthodox Church. Lay piety was booming and there was popular interest in the Church’s promise of salvation. The success of the Church of Rome brought with it profound problems. The moral and spiritual quality of its clergy in many cases left much to be desired. Concern was widespread at the state of the Church and of popularly held religious beliefs, which although often enthusiastic, was frequently characterized by ignorance and unorthodox beliefs. Attempts at reform were often undermined by the unresolved problem of authority within the Church; did the authority lie with the pope or a general council? The invention of the printing press dramatically quickened the pace of debate by facilitating the questioning of established truth by clergy and laity alike; of approximately 250,000 works printed in Europe between 1447 and 1600, almost 75% were concerned with religious matters. The propagation of the Reformation and the Roman Catholic Counter Reformation would have been impossible without the advent of the printing press. The Reformation began as a revolt of the clergy as Martin Luther (1483-1546), Ulrich Zwingli (1484-1531), Martin Bucer (1491-1551) and many others who rejected the authority of Rome and the Catholic Church, attacking the papacy and basing their challenge on the authority of scripture which was increasingly becoming available in translations in the language of the people rather than in Latin. These ideas proved attractive to many lay rulers, who embraced reform. The emergence of a second wave of reform led by the French reformer John Calvin (1509-64) led to an increase in the numbers of those who broke with Catholicism and turned to Protestantism. Protestantism by then had already become established in a significant part of Northern Europe with Protestantism becoming the official religion in large parts of Northern Germany, Sweden, Denmark, Scotland and England. Calvinism spread rapidly through Holland, Poland, Hungary and France. By 1570 there were as many as 1200 Calvinist Churches in France alone. Calvin brought sophistication to Protestantism and although Catholicism appeared to be in retreat with Protestantism having official status in some countries, the new faith was not yet firmly rooted and it would take time to educate the people in the new religion. The Roman Catholic Church did not take this challenge to its hegemony lying down and begun a vigorous recovery after the Council of Trent (1545-63) when it reaffirmed its doctrines in response to the Protestant challenge. These doctrines have largely determined the present dogmatic, disciplinary and liturgical character of the Church of Rome today. Infallibility promulgated in 1870, Transubstantiation and Purgatory, the Sacraments, hereditary ritual, cult worship and the blasphemous Mass form the basis of Roman Catholicism today. The Reformers taught that justification was to be gained by faith alone and that this was the only true path to salvation and not by vain repetitions or rituals. The only sacraments commonly accepted by the Reformers were those of Baptism and the Eucharist (celebrating Communion), whereas the Church of Rome persisted with the sacraments of Confirmation, Penance, Marriage, Holy Orders and Anointing of the sick. The Anglo Catholic (or Catholic as they prefer to be known) element in the Church of England concur with the Church of Rome with regard to the sacraments. The lack of cohesion and orthodoxy within the Reformation movement meant that the aspirations of the early Reformers to achieve a universal church could never be fulfilled. The divergence with radical sects such as the Anabaptists and Antitrinitarians (who survived vigorous persecution) and the many diverged forms of Protestantism meant that discipline was always a problem. The second half of the 16th century was a time of adjustment, as rulers switched between brands of Protestantism, or as in England where Mary I (1553-58) who as “Bloody Mary” gave us many of the martyrs of the Reformation, attempted to effect a reunification with Rome. Where Protestantism failed to gain the support of the authorities it withered and died. In France in 1685, Louis XIV revoked the Edict of Nantes, which had granted religious and civic liberties to Protestants since 1598. This led to the slaughter of thousands of Huguenots and forced thousands more to flee into exile. Some of the descendants of these Huguenots formed a part of King William’s army in Ireland. In Eastern Europe, Roman Catholicism outflanked the Protestantism and reformation in that area of the Continent never really troubled the established Church. Sometime after 1517 there were attempts to establish the Reformed Faith in Poland and Lithuania in the Calvinistic and Lutheran forms and by 1522 there were calls for the new religion to be established in Gdansk. Activities surrounding the new religion however remained largely covert and were dependent on the support and protection of members of the nobility who had taken to the new religion. By 1550 however the Reformation had transformed from a clandestine movement into an open and organised form of worship with Churches, Public Services and Synods being established, at a time when the Protestant gentry began to form a majority within the Lower House of Parliament. The weakness of the Reformation in Poland and Lithuania stemmed from its late introduction into these countries, its propensity for internal fragmentation and a lack of permanent and expandable established body of clergy. The Polish Reformation reached its highest point in 1573 with the Confederation of Warsaw, but by then the cracks in the Reformation in the Polish-Lithuanian Commonwealth were already apparent. By 1582 the only remaining Protestant Senators within the Parliament were Lithuanian. The decision of King Sigismund III (reigned 1587-1632) to only appointing members of “the Catholic faith” to offices of state, acted as a catalyst to encourage the reconversion to Romanism of the Polish nobility. The failure of the Zebrzydowski Rebellion of 1606-07 marked the beginning of the end of the widespread political influence of members of the Reformed Faith and the end of the possibility of a widespread groundswell of the populace towards the new faith. With the situation being unstable it took time for new religious beliefs to take hold amongst the peoples of Europe. Protestant rulers found that the old beliefs were hard to change even where people welcomed the destruction and overthrow of the power of the Roman Catholic Church and its clergy. Nevertheless, with the use of the printing press in the propaganda war the diffusion of the new religion throughout Europe proceeded apace, being accompanied by vicious civil wars and widespread persecution. It was only after 1660 that the religious map of Europe took on a more permanent shape as the success of evangelization made it difficult for rulers to challenge the new found religious beliefs of their subjects. Only now were the religious divisions of Europe accepted, if not welcomed by Rome. With the situation being unstable it took time for new religious beliefs to take hold amongst the peoples of Europe. Protestant rulers found that the old beliefs were hard to change even where people welcomed the destruction and overthrow of the power of the Roman Catholic Church and its clergy. Nevertheless, with the use of the printing press in the propaganda war the diffusion of the new religion throughout Europe proceeded apace, being accompanied by vicious civil wars and widespread persecution. It was only after 1660 that the religious map of Europe took on a more permanent shape as the success of evangelization made it difficult for rulers to challenge the new found religious beliefs of their subjects. Only now were the religious divisions of Europe accepted, if not welcomed by Rome. The impact of the reformation within the United Kingdom differed in Scotland and the North of Ireland where Presbyterianism became the predominant branch of Protestantism where there was no hierarchy from that of England where an Episcopalian hierarchy remained. In 1650 Charles II was crowned King of Scotland but only after having been forced to accept an adherence to the Presbyterian faith with a whole host of humiliating conditions. As King of Britain he indulged his brother James dalliance with Roman Catholicism. James eventually converted to the Roman Catholic faith and played an active part in the suppression of the Scottish Covenanters. Efforts to have James excluded from the line of succession were unsuccessful and when he became King in 1685 he began an inexorable re-introduction of the trappings of the Church of Rome. It was in response to this Counter Reformation that an invitation was extended to William Prince of Orange (who was fourth in line to the throne in his own right), to come to England and with his wife Mary (James daughter) become King and Queen. William accepted the invitation to come to the defence of the principles of the Reformation and to oust the Roman Catholic King James II. His victory in England was bloodless, not so in Ireland and it is out of the armed conflict that took place there that the principles of The Orange Institution were born. Without the Reformation there would have been no Counter Reformation, no need for William Prince of Orange to answer the call to prevent our country from being subsumed once again by Popery and no need for the Orange Institution which at the time it was formed was primarily as a fighting organisation.